Posted on May 31, 2018, 11:23 pm, by ohiit, under Personal. Today is the day that I decided to check my ohiit personal web log and wow I haven’t updated in years since 2013. Oh my goodness that it flew to May 2018. Long story short, been busy with personal life, married life and I got married and have a child. My baby daughter. Oh…what the heck am I doing and it seems that the years flew by just like that and I am advancing in age. Seriously!! I don’t know why I am here for but am to express my personal thoughts out onto the web since I hate writing with a pen and a paper since technology is so advanced nowadays and people are glued onto the mobile screen typing away with fast nibble fingers. Especially FaceBook are so entertaining. DANG IT!! How awesome is that? But one thing is the same old me. I previously quit my boring job as IT Engineer in October 2017. Previously took a big break and flew to Hong Kong to see my wife and my daughter as they are there to spend more time with my mother-in-law. My MIL is diagnosed with 4th stage liver cancer and haven’t much time to live. I am glad and thankful that I got to spend those 3 month of Dec 2017, Jan & Feb 2018 being with them and bonding times which are precious moments. I have MAD respect for my mother-in-law for being a strong woman despite all those cancer that is eating her liver up and yet she continue to cook and fed us well during my stay there those 3 months. But alas last 1st April 2018 my mother in law passed away suddenly in hospital. I took the quickest flight to Hong Kong to see my mother-in-law and at the same time was on Face-time with my wife which showed me about her mother dying on the deathbed with her eye and mouth wide open. I can’t imagine what it was like but painful to watch like that. We all cried. The next week we have to plan out the funeral and settle everything. Took another 2 month stay which is April and May 2018 there in Hong Kong to help my wife to settle everything especially taking care of my baby daughter which she is now a toddler month old while she do other important stuffs. There is one big difference between Hong Kong and Singapore funeral is that HK has limited space and need to set a date to hold a proper funeral in a proper casket according to HK law but in SG the funeral can be planned out the next day the quickest possible because it can be held in void deck of HDB in Singapore. Some people said Hong Kong funeral can take a few months to settle. Lucky we took 3 weeks to prepare for her mother funeral and another month to settle her mother ashes to be scattered at H.K. 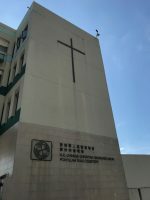 Chinese Christian Churches Union Pokfulam Road Cemetery which is at Hong Kong Island.